Aketon - It is the padded garment worn under armor to absorb shock. The term evolved from cotton. Arming Cap - It was a quilted cap worn beneath the helmet. Arnis - It is the Italian for "harness", that means being "in armor". Barbute - An Italian helmet design of the mid-15th century, barbute or barbuta was a close-fitting helmet that came in a variety of open, and close-faced forms. It had a "Y" or "T" shaped slot in the face for vision and ventilation. It evolved from ancient Classical Greek helmets. Besagew - It was a large, sliding roundel for protecting a joint, such as the inside of the elbow or the armpit. Bevor - Also called a baviere or beavor, it was a 15th century armor part that protected the lower face when worn with a sallet. It could be affixed to the helmet. It was often hinged, and could be lowered when not in use. Boss - It was a round or cone-shaped metal plate at the center of a shield to protect the hand. It was slso called an umbo. Breaths - They were the holes or slits in the visor for ventilation. Brigandine - A type of coat-of-plates (see below) with hundreds of small, overlapping plates, providing great mobility at a slight cost in protection. Popular in the 15th and 16th centuries, the brigandine was usually worn over padding, but not mail. 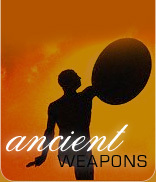 Buckler - It is a round shield, 9 - 18" in diameter, gripped with a single handle. The name comes from the Old French word bocler meaning a "boss". It could even be square in shape, made of metal or wood or a combination. It was used to deflect the punch or blows.the edge and the frontal spike could be used for attack. Buff-coat - It was a heavy coat of buff-leather. It was used in Renaissance period under a breastplate or alone. Burgonet - It was an open-faced helmet with crest and cheek-guards, used in the late 16th and early 17th centuries. Byrnie - It was a mail shirt of mid-thigh length, with elbow-length sleeves. It was worn by the wealthy warriors during 11th century. Camail - It was a curtain of mail, hanging from helmet, as a defense for the chin, neck, throat and shoulders. Cap-a-pie - It is an Old French expression, meaning to be armed from head-to-foot. Chausses - The word means leggings. They were the mail leggings, tied to the belt by leather thongs, worn over quilted leggings. Close-helmet - It is a close-fitting, full helmet, of the 16th and 17th century. Coat-armor - It was a coat like armored garment worn during the late middle ages that showed the wearer's or his Lord's bearing. Coat-of-Plates - It was a coat of heavy fabric riveted with metal or bone plates from inside. It was a type of flexible plate armor used in 13th and 14th century. Coif - It was a hood of fabric or mail, worn under the helmet. Couter - It was a plate armor for elbow. Cuirass - It is the Roman term for a full, plate body-armor. It comprised of a breastplate, backplate, and sometimes, tassets. Cuirbouilli - It was the hardened leather, hardened by boiling. The material was used for armor during 13th and 14th century. Cuisse - It was a thigh armor made of quilted garments, but term also later applied to plate defenses. Enarmes - Leather grips of a shield. Gambeson - Also called aketon, it is a quilted coat armor worn to absorb shocks. It was generally worn under the breastplate. Gardebras - It was a full arm-harness including couter, vambrace and rerebrace. Gauntlet - It was the armored glove formed of a single plate for the back of the hand, and overlapping plates for the fingers, enabling them to move easily. Gorget - It was the neck and upper chest armor. Great Helm - it was the first ever helmet that enclosed the whole head. It was made of four or five iron plates riveted todether. It was worn over the mail coif or a skull cap. Greave - Shin and calf armor. Harness - Medieval term for armor. Haubergeon - It was the armor shirt or the armor with the skirt removed. Its length reached just above the mid thigh. It was a tyoe of mail coat of 14th and 15th century. Hauberk - It was a long knee length mail coat, usually half sleeved. Later the sleeve length was increased. It was used from 11th to 13th century. Jack - It was a double layered fabric or leather coat with metal plated in between. Jupon - it was a short fitted coat worn over the armor. It was made of thick fabric layered with velvet or silk and embroidered arms. Kettle hat - It was a plain iron broad brimmed hat worn during 12th to 15th century. Lammellar - It was a semi rigid armor that originated in Asia. It has short metal plates overlapped and laced together. Mail - It was an armor formed of rings riveted together. It was flexible but heavy. It had to be propperly belted to remove the load from the shoulders. It was worn over a padded fabric. Morion - It was a helmet with a curved brim and a comb. It developed after the spanish conquest of Americas. Pair of Plates - It was a form of a body defense, with larger plates than a standard coat-of-plates, but without a solid breastplate. Pauldron - It was a plate armor for the shoulders, formed of overlapped and articulated plates. Poleyn - A plate armor for the knee. Rerebrace - An armor for the upper arm. Sabaton - An articulated, steel foot armor. Salade/Sallet - It was a helmet of the 15th and 16th century with a small, hinged visor, and a long, articulated tail, to protect the back of the neck. Shield - A shield was a defensive device. It could be in a variety of shapes and sizes. It was made of metal or wood covered with leather. It could be hung from the arm or gripped in hand. Sights - They were the eye slots in the visor or the face plate. It was also called occularium. Studded and Splinted Armor - It was used in 14th century. It could be made of a variety of rigid materials riveted together on the inside of a fabric. It was probably the transitional time from mail to plate armor. Tabard - It was similar to surcoat but slit down the sides, with the front and back held together by ties. Tabards were used in tournaments to display the knights' heraldry in the late 15th century.They are still worn by English College of Heralds on ceremonial occassions. Targe - It was a small wooden shield with a leather cover and a metal trim. It was usually flat. It was used by the Scots. The term comes from the word target that was used as archery practice dummies. .
Target - It was a round shield that could be mounted on the Most targets were large and made of wood, but during the Renaissance, a smaller 24" diameter steel targets became popular. Tassets - they are the overlapping plates to cover the juncture of hip and thigh in a plate armor suit. Vambrace - The fore arm armor.